Columbus RAC Information | Ohio Healthcare Audit Lawyers Wachler & Associates, P.C. Contact Ohio Medicare Lawyers Wachler & Associates, P.C. Health care providers in Columbus may already be familiar with the Recovery Audit Contractor (RAC) program. Effective now, the RAC program has expanded nationwide and will affect Medicare providers in Columbus and the surrounding area. With the passage of the health care reform legislation, the Patient Protection and Affordable Care Act (PPACA) expanded the RAC program to Medicare Parts C & D, as well as Medicaid. The experienced health law firm of Wachler & Associates, P.C. 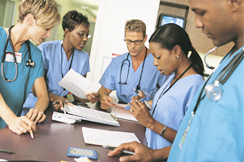 has defended health care providers in RAC audits across the country. Our knowledgeable attorneys guide Medicare providers through the audit process. Contact us to discuss how we can help you respond to a RAC audit or to appeal an adverse determination. Although hospitals and health systems are expected to be an integral focus of the audit program, all health care providers should be carefully attuned for the possibility of an overpayment claim. Recently the Government Accountability Office (GAO) recommended that CMS focus post-payment reviews on home health and durable medical equipment providers. An essential component to success in the audit appeals process is effective legal counsel. There are five stages of the RAC appeals process including redetermination, reconsideration, an administrative law judge (ALJ) hearing, a Medicare Appeals Council (MAC) review and an appeal in federal district court. Our attorneys are very experienced with this process. We will guide you through the most effective strategies to minimize your financial exposure and focus on the best course of action with high professional responsibility and competence. Contact Wachler & Associates, P.C. to discuss how our legal team can help you in your preparation, defending, or appealing of a RAC audit. We also represent clients in other Medicare audits such as ZPIC audits and all types of third party payor audits.